The inaugural release from Reagan National Crash Diet and the first release for RoosterCow Records. Recorded by Kris Poulin at the Lab East Recoding Scenario, this EP shows where Nash Crash was after only a few months of playing together. The covers were silk-screened by Jason Frederick of The Means. If there is one complaint to be made about punk, or punk rock, or just plain rock music these days, it would have to be that most bands take themselves too seriously. When one does find an inkling of humor embedded in a punk song, it is of the bitter sort, eliciting a spitting, harsh laughter bereft of any joy. Granted, times are serious, and punk bands are usually commenting on the things that piss them off--not puppies or flowers or what they find amusing. That said, it's a relief to see, and hear, a band like Reagan National Crash Diet. From the opening lines of "Ghetto Sled," on its disc Administration, it becomes immediately apparent that these boys and girls have a sense of humor. Over a fast beat as forceful and sloppy and relentless as the car they describe, singer Chris Auman informs us: "I don't come from the ghetto.../ But I drive around town in my ghetto sled/ And I hate it when the light turns red." And the music is nice and hard too, crunchy and atonal, but catchy in the vein of the Jon Spencer Blues Explosion--wild and pounding, and daring the listener to join in near the edge of chaos. RNCD is good at drawing you back from the brink of the abyss with infectious beats and guitar lines written in such a way that they hook the listener with out seeming heavy-handed or jingly. There are bands that pay very, very careful attention to the fashions and latest crazes of the music scenes, mainstream or underground, and build their sound in hope of crossing paths with the hip sound of the moment. There are bands that tend to follow their own route, though they're still aware of the workings of more fashion-conscious bands. 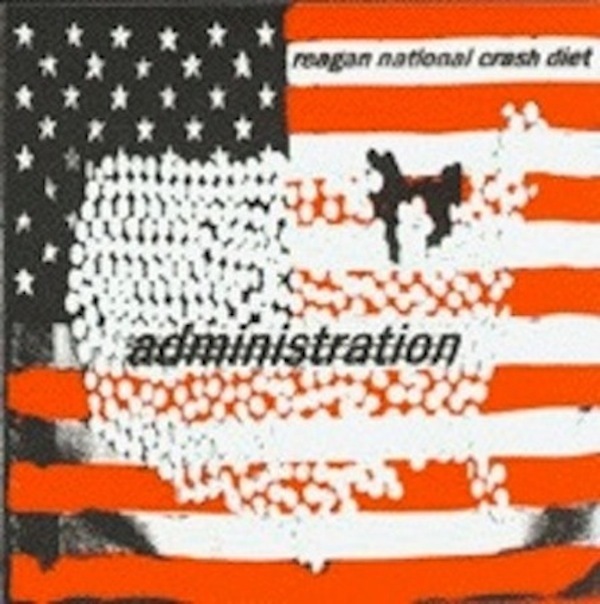 Then there are bands like Reagan National Crash diet, which are apparently oblivious to anything going on around them. In the case of Administration, obliviousness turns out to be a pretty darned good characteristic to have. While there are legions of bands stuck imitating the hottest trend or, in true other-side-of-the-coin fashion, doing everything possible to distance themselves from the pack, Crash Diet skips along on its merry way, content to indulge its own idiosyncrasies. With a ballsy, guitar-driven sound, Crash Diet has a style that vaguely falls into the punk world, mostly because it's the best-fitting forced metaphor out there. Think of Reagan National Crash Diet as a trash-rock band that's not about to let the serious business of decadence spoil its fun. Because of this, there's a lot of distance between the band and acts like The Supersuckers or The Streetwalkin' Cheetahs, both ideologically and musically. Instead of the balls-through-the-roof nonsense of overblown bar rock, the Diet lets its guitars thrash about with a sense of fun. There's all the boisterous noise and volume of trash punk, but the band isn't going to let tough-guy nonsense spoil its fun, whether its with the bouncy pop that filters through a dark tunnel of distortion ("DNA") or the exuberant shouted male/female vocals ("Highway Thrill Girl"). The act's fun-loving side is always there, though during the half of this record where guitarist/singer Jennifer Charles takes to the mic' it's a lot more apparent. Similarly, the Crash Diet doesn't have to wrap itself up in tales of whiskey, weaponry and women, as its straight-faced humor's all it needs to keep its songs going. Whether it pokes fun at the "pretty fly for a white guy" love of ghetto wheels ("Ghetto Sled") or rages against sleazy, last-call Romeos ("Anamoly"), the Diet's low-key humor sets the band apart from the straight-faced world of junk rock. While Administration is probably a bit too eccentric for everyday listening, except for that rare breed of fan who attacks Jeff Dahl records with the same glee as those of They Might Be Giants, it shakes the frowning blues that frequently come with crackling guitars.